Rocking chairs, also called rockers, have been used for many centuries. The classic rocking motion helps to lower blood pressure and calm an individual. These chairs have also been popular among parents who use them to create a soothing motion instrumental for calming their baby. It can be a daunting task to select the best nursery glider. Over time, there have been several modifications that have been made to these chairs to improve their functionality, comfort, and appearance. As a result of these alterations, we now have several types of rockers and some of the best nursery gliders. One popular type is the gliding rocker. Also called a glider, the gliding rocker is a type of rocking chair that mimics a swing. The chair basically acts like a rocking chair but it moves back and forth along a track. The chair is made of several swivels and levers that allow the chair to move on a flat surface instead of arced legs. Because the chair sits flat on the floor, it helps to eliminate the unbalanced nature of the traditional rocker, and it is thought to be a safer way of rocking as the chair is much less likely to topple over. Because they are usually smaller than a traditional rocker, these chairs usually take up much less space. Plus, many people think that that they are much more comfortable than traditional rockers. When you purchase the Status Roma Glider and Nursing Ottoman, you have the option of selecting from a variety of colors. The price of the glider set will vary depending on the color that you select. You also have the option of including a two- or three-year protection plan at the time of purchase. The gliding chair itself has a bow back shape and is made of very sturdy and durable materials. Both the chair and the ottoman are padded so they can offer more comfort, and pockets are placed on the side of the chair so bottles or other items may be stored with easy access. The padding is made of a polyester-filled microfiber blend which is very easy to clean. The chair weighs just about 45 pounds and has dimensions of 24.8 x 25.8 x 39.5 inches. The glider has ball bearings that help it to glide very smoothly in its tracks. Because the chair and ottoman are heavily padded, they are both very comfortable, even for very long periods. Because there is a variety of colors and finishes available, you can select the glider set that would best match your room decor. The nursing stool doesn’t require more storage space because it is built into the ottoman. The glider does not have a side lock option so it cannot remain stationary. If you are seeking a product that is ideal for either your nursery or another living space in your house, look no further. Available in six different wood colors and five chevron design colors, the Stork Craft Custom Hoop Glider has a generous sitting area and padded arm cushions that will ensure you remain comfortable while you rock. There is no need to worry about cleaning the padded cushions on the chair and the ottoman because they are all spot cleanable. The chair also features side pockets so you can easily store things that you may want to have handy while rocking. When you receive this top nursery glider set, you will be required to do some assembly but the process should be quick and easy. For warranty options, you have the choice of including a two- or three-year protection plan. You can contact customer support to request the manufacturer warranty. The chair is generously padded in all the areas that really matter. This means that you are very comfortable while you are using either the chair or the ottoman. The cushions are spot cleanable. Because there are side pockets just below the chair arms, items can be stored and accessed quite easily. You are not stuck with choosing one chair color because there are a variety of color options to choose from. There is no locking feature for the gliding mechanism to lock the chair in a stationary position. The Naomi Home Brisbane Glider and Ottoman Set is sold in an array of colors for both the cushions and the wood finishing. The chair has a maximum capacity of approximately 250 pounds and has cushions which are well padded to provide back support. The seat cushions are also padded for added comfort. The chair has side pockets on the outer side of the well-padded arm rests which can be used to store items. One additional advantage of the Naomi Home Brisbane Glider and Ottoman Set is that it is very easy to clean. The chair is padded so you will not feel the wood frame when you sit in the chair. The back padding provides support for your back while you sit. You can store items in the pockets on the chair so they can be accessed easily. The chair and ottoman fabric can be cleaned easily. The glider doesn’t have a lock feature to keep it stationary. As the name suggests, the Windsor Glider and Ottoman is a combination product that comprises a gliding rocker chair and a matching ottoman. There is a variety of wood finished and cushion styles to choose from when purchasing this product. The chair has padded seat cushions and a very generous area for sitting. The armrests and back cushion are both well-padded to guarantee comfort while the chair is in use. 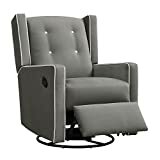 Instead of leaving the comfortable chair to access items that may be far away, the chair has pockets on the sides so you can store these items and access them much more conveniently. The very plush padding in the back of the chair, the seat cushions, and on top of the ottoman makes both the gilder and ottoman comfortable seating options. The fabric is spot cleanable. You can select the color that you prefer since there are a variety of color options available to choose from. The chair is not equipped with a locking system to prevent it from gliding. In other words, the chair cannot be converted to a stationary chair if needed. Breastfeeding may not be as comfortable because there is no nursery stool. The Graco Parker Semi-Upholstered Glider and Nursing Ottoman combination comes in three different colors. The price of the set varies by color. The chair and ottoman are fully upholstered and feature ultra-plush microfiber cushions with more than adequate padding aimed at offering maximum comfort. The design of the product is truly remarkable and timeless. The quality and durability are outstanding as is to be expected from any Graco product. In keeping with the luxurious design, there is a nursing stool that allows the nursing mother to rest her feet while breastfeeding. This stool can easily slide back into the ottoman when it is not in use. The chair is extremely comfortable because it is heavily padded. It has a pull out nursing stool so breastfeeding is more comfortable. It is available in a variety of colors so you can select the colors you prefer best. The gliding motion cannot be locked so the chair cannot remain stationary. Here comes the best-selling nursery glider. It is one of the best gliders you can get based on its features. It is manufactured using super quality microfiber that feels very soft to the touch. It is extremely comfortable, and it comes with track arm design. The motion of this nursery glider is very smooth. It looks elegant, and the details of this chair are what you can cherish for a long time. This chair comes in three shadings, light gray, and charcoal gray and mocha. The durability rate of this nursery glider is very high, and it brings along excellent quality that you can only dream of. This nursery glider requires a little assembling, but it will not take more than ten minutes of yours. The cushioned seat and the spring core foam make this chair a standout! You should try it out! It is heavily padded and is very comfortable. It comes in many colors, so you have a choice. It is a little heavy so it’s difficult to move. This is another amazing nursery glider. It is incredible in construction; it is produced with high-quality polyester fabric. It brings along an ottoman for extra comfort. The ottoman makes the long feeding sessions at night comfortable. You can even take a nap on this comfy glider. It comes in three colors, cream, dark gray and light gray. The back of this nursery glider is very high, which is great for your back and spine. It also accompanies a lumbar pillow so that you can just and relax. The 360 degree swivel motion of this glider chair makes it the best among all others. This nursery glider is manufactured free of all the fire retardants. It is durable and well-made. It is available in gift packaging as well, you can get this for new parents you know. Also, it is covered with one year warranty so you can easily exchange this item in the meantime if you think it doesn’t work well. It is constructed very well. Comes with a lumbar pillow. It does not come with locking feature for the gliding mechanism. This is an oversized nursery glider as it has a lot of room for you and your child. It is produced with the finest quality microfiber. The movement of this chair is pretty smooth and it is quite comfortable as told by the users. 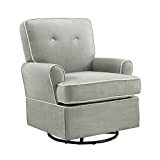 You can feed your child and take a nap comfortably on this glider chair. It is a unisex nursery glider and can be used by both, men and women. It is available in three colors, beige, light brown and gray. You can choose the one that you like. The seat of this glider is thickly cushioned and it provides a great support for you back and spine. Even the arms of this chair are padded. It is a very cozy item and is a perfect addition to your nursery. This nursery glider is famous for its solid construction. It is highly cushioned and very comfortable. You cannot keep the chair stationery because of no locking system. Has a dimension of 34.75″W x 35.75″D x 39.5″H. This is one good looking nursery glider. It is exceptionally comfortable even more than you think. The frame of this nursery glider is wooden and is quite solid. It is manufactured using microfiber material. This chair is entirely cushioned even the armchairs of this chair are padded. Due to its remarkable cushioning, this glider chair is so comfortable. It is available in two colors, ecru and dove gray. This chair is tested for its safety and quality. It is highly durable and something that you can use for years. The gliding motion of this chair is very smooth and it is all you need for a long feeding session at the time of the night. It comes with sturdy frame. Available in limited colors only. Last but not the least, this nursery glider is a real deal. It looks great, is comfortable and is very well-made. It comes with a multi position mechanism so that you can switch the position of the chair according to your comfort. It is produced with a hardwood frame, and this is the reason why it is so solid and durable. The fabric used in the making of this nursery glider is microfiber. It comes with foam cushions, and they feel extra soft that you can even sleep on it. The arms are padded for extra luxury. This item is covered with a warranty of five years. So if you think there is anything wrong with it, you can exchange or return it in the given time. Because of the incredible warranty, it is safe to call it the best product of all time. The great construction and the harvest finishing make it top our list of the best nursery gliders. Also, the finishing of this glider chair is free of all the toxic materials and you would not find any sharp edges, which is again fantastic. It is entirely padded for extra comfort. A glider chair does not move on arced legs. Instead, it moves back and forth along a gliding track. Rocking chairs with curved bases tend to follow the arcing motion so this is one feature that differentiates the two chairs. 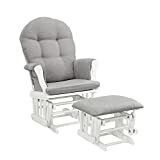 Many glider chairs include a seat cushion or upholstery. Some cushions can be easily removed for cleaning. On the contrary, there are some rocking chairs that do not have any form of upholstery or seat cushions. Outdoor gliding chairs are made of materials such as plastic, metal, or even wood. Some gliding rockers may be sold in a set with an ottoman. The included ottoman may be stationary or it may move with the glider. In addition, the ottoman can be used as a nursing stool and serve as a footrest while breastfeeding or rocking a baby. There is a large variety of gliding rockers available for purchase. They are made in different styles, colors, wood finishes, and materials. Selecting the gliding rocker chair that perfectly suits you will be largely based your personal preferences. However, there are some basic features and factors that you may want to consider before making your purchase of the best nursery glider. 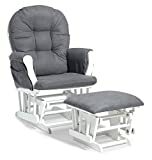 As with everything you buy, you may want to assess your financial situation to determine how much you are willing or able to spend on a gliding rocker. Your budget may determine the sites or stores where you shop because of variations in price. You might choose to buy a used glider and refurbish it as a DIY project, or you may prefer to purchase it new. Whatever you choose, ensure that it is an affordable option for you. Because you will spend a lot of time in your glider, you need to make sure you select one that is very comfortable for you. It would be ideal to sit in the glider before you purchase it. You can compare models based the comfort level you prefer. Your glider should provide support to both your head and back while giving you room to change your position with ease. Remember that you may be sitting with a baby in your arms so you want to be able to move or adjust your position quite effortlessly. The height should be suitable for you so you can get in easily, and you want your feet to comfortably touch the ground. If you intend to hold a baby while sitting in the chair, you may want to consider armrests with padding to increase your comfort level. If you have children who will be walking, running, or playing near the gliding rocking chair, you can expect to have all sorts of things spilled on it. If this is the case, you will want to select a chair that can withstand rough treatment. You may want something that is also easy to clean so look for features such as a removable, washable seat cover or cushions that can be spot cleaned. Stay away from sharp edges and check to ensure that the frame is sturdy and solid. Look out for parts that may squish fingers or cause injury to your child. Be sure the chair has passed all safety inspections. Several glider chair styles are available, and the style you prefer may be determined by where in your home you intend to place the glider. Do you prefer something with a more traditional design? Would you like it to be more modern? Will it be used primarily for breastfeeding and soothing your baby or will it be used by the entire family? Will it be a focal point of your living space or will it be in a corner of the nursery covered with a blanket? Whatever the case, you want to select the ideal chair to suit your individual needs. Whether you feel the need to go with a more neutral look or something that may be considered an accent piece is entirely up to you and your budget. If you are purchasing a glider for your nursery, you should think ahead. Your baby will eventually outgrow the need for a nursery. Instead of throwing out the glider, you may want repurpose it in another room. Some gliding chairs can be converted to stationary chairs by changing the base. Some models are equipped with a lock system which can prevent the chair from gliding, converting it to a stationary chair. Also, there are gliders with a reclining feature so it can be used as a recliner chair. Whatever your preference, consider the long term use of the chair when making your purchase. Not all gliding rockers are sold with a matching ottoman, but it may be a feature worth considering. The ottoman can be used as a footrest or even used completely separate from the glider. Some gliding rockers are also sold with the option of locking the gliding motion. This stops the chair from gliding in the track. Some chairs include a reclining feature for even more comfort. If the cushion covers are removable, you may be able to purchase new ones and completely change the look of your glider. Nursery glider is a must have for everyone with little children or toddlers. All these nursery gliders are great in quality and performance. I believe I have covered everything you need to know about the nursery gliders. I hope these reviews help you out. Have a great day!